Campgrounds on the Blue Ridge Parkway! If you own or have the opportunity to rent an RV, you have the potential for an unforgettable trip. Traveling in a camper will present more chances to immerse yourself in and enable you to feel closer to some of America&#39;s most beautiful natural settings. There are 110 campsites west of the Parkway, 25 trailer sites to the east, restrooms, a 250-person campfire circle, and camp store. Doughton Park&#39;s restaurant is accessible by trail. 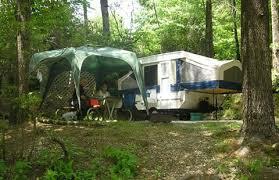 The Parkway&#39;s largest campground has 129 tent sites, some directly on the shore of Price Lake. If you can snag a lakeshore site, it&#39;s a perfect &quot;golden pond&quot; camping experience. There are also 68 RV sites, an amphitheater, and boat rentals. Great hiking options include the memorable lakeshore loop of the&nbsp;Price Lake Trail. The only Parkway campground with group camping. There are 55 tent and small R/V sites; 15 large R/V sites, a 150-person campfire circle, and many trails to the falls. And just off the Parkway, atop Mount Mitchell, the state park&#39;s small tent campground offers the East&#39;s highest tent camping. You can actually see the summit tower from some sites. Ashe County is a remarkable place to live or relocate to. When you own Blue Ridge Mountain Real Estate in Ashe County North Carolina, you will enjoy having a place to escape and getaway to for years to come. We can help you purchase Homes for Sale West Jefferson NC in one of the most preserved regions of the Blue Ridge Mountains. This region of Ashe County is one of the premier areas to buy Western North Carolina Mountain Property as it is still largely undeveloped. If you are interested in Land for Sale in Ashe County, check out the Ashe County NC Real Estate listings in Crumpler for some great large tracts. View our website (www.a1mountainrealty.com) and browse our listings or you can do a MLS search for any property in the High Country. ← Picnic Areas on the Blue Ridge Parkway!